Custom dimensions are incredibly useful for gaining a new perspective on your data, such as by identifying sessions where users are logged in, whether users are members of your organization, account holders, or if they belong to a particular audience type or role, for example. 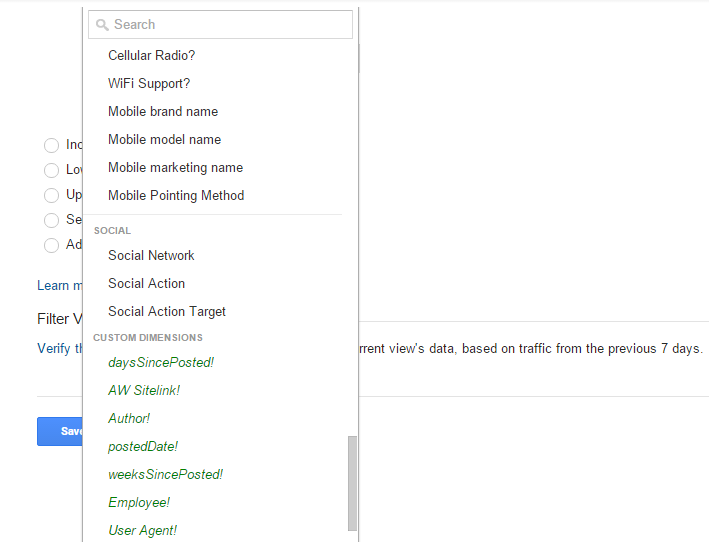 To get even more granular, you can filter your Google Analytics traffic with these custom dimensions as well. For example, Jon Meck wrote a useful post in the past that included the use of a custom dimension as an option for excluding internal traffic. In addition to creating a method of segmenting all of your standard reports by a custom dimension, this can also be helpful in preventing problems with sampling, for example. Note that this post assumes you already have custom dimensions set up and passed to Google Analytics correctly on your website. You can find out how to do that in one of our previous blog posts: Defining Audiences with Google Analytics Custom Dimensions. 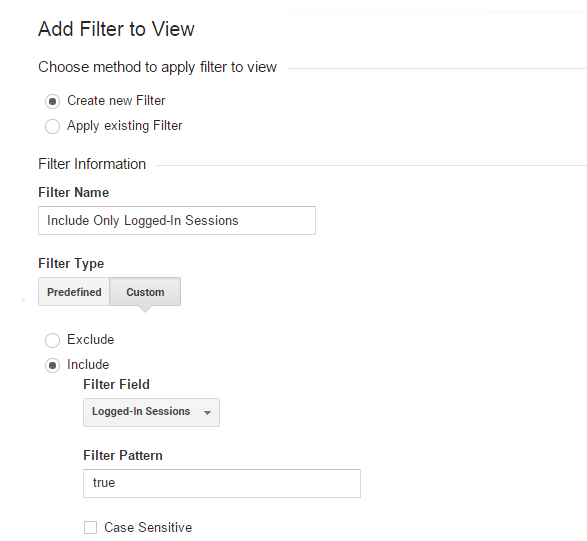 To do this, you will need to create the filter at the view level (instead of at the account level) because custom dimensions are defined at the property level. The custom dimensions that you have created will appear at the very bottom of the Filter Field drop-down list. But how exactly does it work? What if I have some users who do not immediately trigger the custom dimension during their visit to my website (maybe they view a few pages before reaching one that sets the dimension) – how will that data look in my new view? Will Real Time reports show all of the hits? If you’re doing any kind of analysis based on session- or user-level custom dimensions in particular (such as any of Sayf’s recommendations), you will undoubtedbly ask yourself one of these questions at one point or another. Unlike hit-level custom dimensions (or product-level dimensions, for that matter), session-level and user-level dimensions are applied to all hits defined in their scope – this is important to understand when trying to segment data in a view based on filtering with custom dimensions. 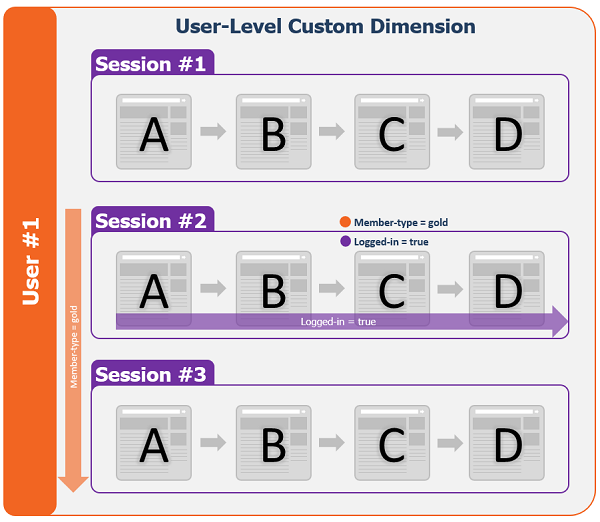 Let’s review how the data will look in different views that include or exclude traffic associated with user-level and session-level custom dimensions. Session-level custom dimensions are applied to all hits in a single session, regardless of when the specific hit occurred that set the custom dimension. User-level custom dimensions are applied to all hits in current and future sessions (at least until the value changes). Hit-level custom dimensions are applied to only the hit with the dimension is sent to Google Analytics. Product-level custom dimensions are applied to the product with which the dimension is sent to Google Analytics. For more information on scope, take a look at Google’s support page. During processing, custom dimensions are applied to the appropriate hits based on their scope so that you can see all of the hits associated with a given custom dimension in your standard reports. This means that, within our standard reports, we are able to see all of the pageviews that occur within a session where a session- or user-level dimension was applied, regardless of when exactly that dimension was applied. Say you have a custom dimension at the session level, called “logged-in,” that you set to either “true” or “false.” You can use this to create a View in your Property that only includes traffic for sessions where “logged-in” equals “true.” If a user visits your website and views two or three pages before actually logging in, we should still see this user’s initial pageviews our filtered view, even though they did not log in immediately. The custom dimension value is stored for all of the hits for that entire session, all of the hits before the custom dimension was set and continuing for as long as the session remains alive. Those initial, pre-logged-in pageviews will appear in our Top Pages report in Google Analytics in both views after Google Analytics has processed the hits. You will not see them in your Real Time reports, however, so keep this in mind if you are doing any debugging using the Real Time reports. Even if the custom dimension is set in the middle of a session, we’ll get the information about that entire session and every session after that until the value changes or cookies are changed. 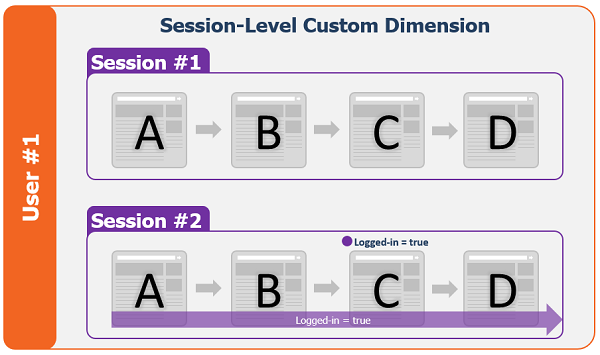 If you exclude traffic based on a session-level custom dimension, such as excluding logged-in sessions, all of the pageviews during a session where the dimension was applied will be excluded from your standard reports regardless of whether or not the user immediately logged in. So if a user views two or three pages before logging in later in the same session, all hits occurring in that session prior to logging in will be filtered out of your standard reports. The same goes for excluding traffic based on a user-level custom dimension, such as excluding “member” traffic. If a user comes to your website, views a few pages prior to being labeled as a “member,” those pageviews will also be filtered out of your standard reports – along with all future hits from this user. Again, keep in mind that because filtering occurs during processing, your Real Time reports may not show accurate information when filtering by session-level or user-level custom dimensions. In other words, if you are excluding traffic from logged-in sessions, but some users view multiple pages prior to logging in, your Real Time reports will still show those pre-logged-in pageviews. Sidenote – if a user has a session-level custom dimension applied that defines them as a logged-in user, and then they log out, the custom dimension value of “false” is applied to all of their hits for that session. This means their entire session will be considered a “logged-out” session! If your website has the ability to log out and encourages that behavior, consider using a hit-level custom dimension instead.